Is it me, or should I really start getting the ark out? I can not get over the amount of rain we are getting. 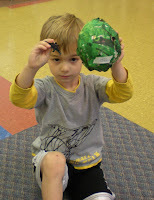 We had to use our paleontologist skills inside today, but it worked. 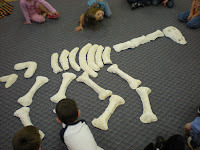 Our first matter of the day was hunting for dinosaur bones and creating our dinosaur skeleton. This is usually the last activity of the camp, but because of the rain I had to rearrange things. 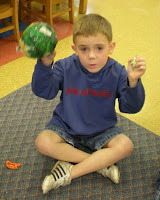 Mrs. S. and I hid the bones in the rooms and the children did the hunt and building, first thing in the morning. They did really well. They each found two bones and brought them back to the rug. 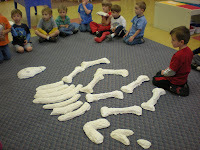 Then I had them look at the bones to try and figure out what part of a dinosaur they might be. 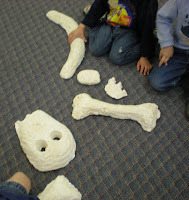 They figured out the head and leg bones. I helped lead them on the ribs, neck and tail bones. 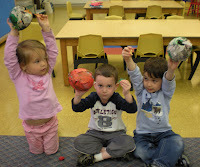 Then I had them arrange them as best they could to create our dinosaur. 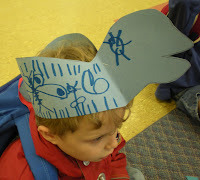 I had forgotten to bring my picture along so I wasn't sure exactly where everything went, but I think our dinosaur turned out just fine. 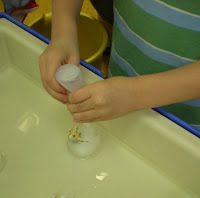 They then went to use their skills to excavate a dinosaur from the ice. 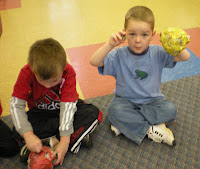 We talked about tools a paleontologist might use. They said a hammer, but we thought about it and figured a hammer might break the bones. They had brushes, and scrapers, we had water. 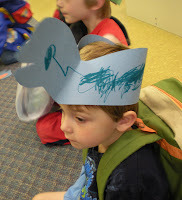 Each child got some ice with a dinosaur in it and we filled Nancy bottles with warm water. 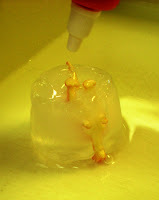 They had to squirt the ice and use their strength to get the dinosaur out. 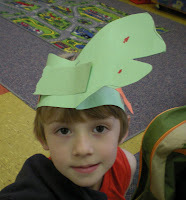 I then made dinosaur hats with them. 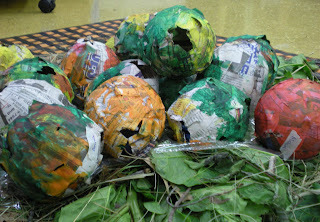 I had actually seen this project on a site around Chinese New Year. 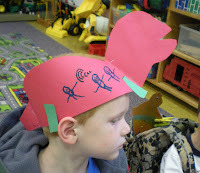 The person had made dragon hats like this. As hard as I tried, I could not find the site I saw these on. If you recognize them, please let me know. I know my pattern isn't 100% correct, but they worked okay. 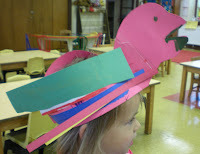 Because of time, I let the children pick a color, I cut out the pattern, and they decorated. They looked pretty cute leaving today. And...finally, our eggs hatched. Before the children got to school today I took a pair of scissors and cut the knot of the balloon out and the balloons shriveled up inside. 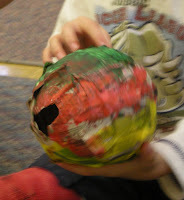 When it was time each child got their egg from the nest and tried to retrieve the dinosaur inside. We tried to keep them intact as best as possible since we worked so hard on them. One got torn in half, and another got sat on, but for the most part they left still looking like eggs. Just an FYI--the balloon wrapped around the dinosaur after I cut it, some of them had trouble unwrapping the dinosaur from the balloon. 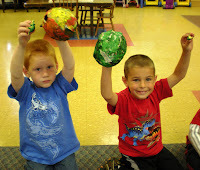 We read a book called "Dig a Dinosaur," by Norma L. Gentner which is actually a little song(Sorry I can't find a picture). It was the first time I had ever read it. Some of the children knew the book though. They enjoyed the song aspect of it and could join in at some parts. We had a wonderful and extremely FAST week at dinosaur camp. The children were just marvelous. I think they really did a great job. I am done teaching now until September rolls around. It would be great to have some down time. But, director duties never end. I can't believe everything I have to start getting ready to mail out in July. I hope you enjoyed visiting with us this week. It was great to have you all! I want to be in your class! That dinosaur skeleton is awesome. I love Dinosaurs. Looks like you all had a fun time. 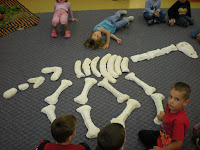 Bones, Bones, Dinosaur Bones is a favorite book. I THOUGHT you were up to something with the hatching! What a fun idea!!!! I think I need another exclamation point! I love the geting the bones out of the ice. Couldn't you have done this stuff 3 weeks ago when we did Dinos!? So cool! I want to have a dinosaur party just so I can do this! what a wonderful way to finish it up. i'm going to remember these for D week! This is fantastic! My daughter is crazy about dinosaurs right now! Love all the ideas esp. the dino in the ice! Thanks! Wish you taught at my daughter school! 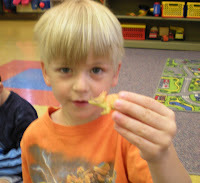 Found your blog via Tot School. 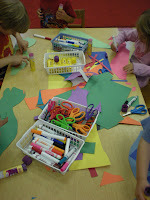 I am so excited b/c we are doing a dinosaru theme this week at our house and I'm lookin for lots of hands-on activities. I'm off to peruse your blog! You too? It has been raining here for a couple weeks here. I love it, we don't usually get this much rain. Thanks for stopping by the giveaway. I do enjoy reviewing products... It's fun. brillant! i am not sure if i want to do this for my kids, or i want someone to do it for me!! how fun!!! great stuff. your kids and parents/guardians must love coming to class!